Over the 4th of July weekend, Tom and I decided a road trip to Northern California was long overdue. After an anti-climactic, ultra-low-water run down the Box Canyon Section of the Sacramento River, we wanted to paddle something a bit more challenging and headed into the Trinty Mountains. Destination - the Cal Salmon. The road back to the run was narrow and rather scary, barely wide enough for my truck in places. At a tiny pull-out, we parked and peered over the edge of the cliff. Gazing down into the deep gorge, I found certain anatomical features on my body were beginning to contract. Let's see, I thought quietly as I took in the view. Down over 250 feet in a vertical-walled gorge.....a class IV followed by the class V- .......no way to portage...... probably not a good place to screw up. I sure hope this is a good day... Not wanting to show my concern, I turned to Tom and enthusiastically said, "Let's do it!" ...and Last Chance (class IV) just upstream. 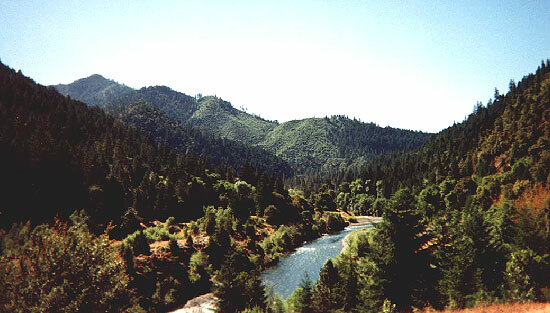 The California Salmon River is a true gem, with clear emerald green water in a deep formidable gorge. 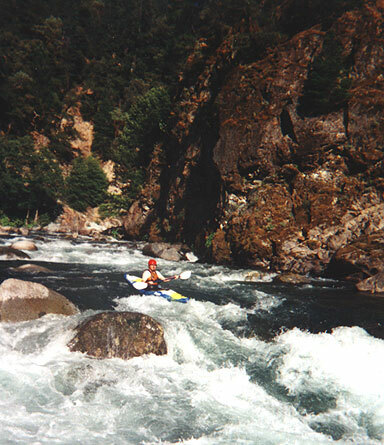 The river truly pushes the definition of pool drop; short yet extremely calm sections between steep, challenging rapids. This is not a river for beginning or even intermediate boaters. Lost equipment or unexpected injuries means climbing up nearly sheer 200-300 foot cliff walls. That said, if you do decide to run this river, the adrenaline fix you get on the upper six miles of the Nordheimer run will last for several days. Additionally, you will be rewarded with spectacular views and numerous encounters with wildlife. We saw two nesting ospreys, a bald eagle, a garter snake, numerous ground squirrels, and a doe with two fawns in just six hours. The view upstream of the put-in. The nature of the river varies markedly with the flow. We did it at 700 cfs, which was about minimum. Some friends did it two weeks earlier at 1400 cfs and were put to the test. The put-in at Nordheimer Creek is relatively deceptive if you did not pay attention on the six mile drive up from Butler Creek. The half mile of class II water gives a paddler time to warm up (or cool down) in the California heat before entering the gorge. Upon the first hard right turn, eddy out left and scout Bloomer Falls (class IV). A landslide created Bloomer Falls about 35 years ago. 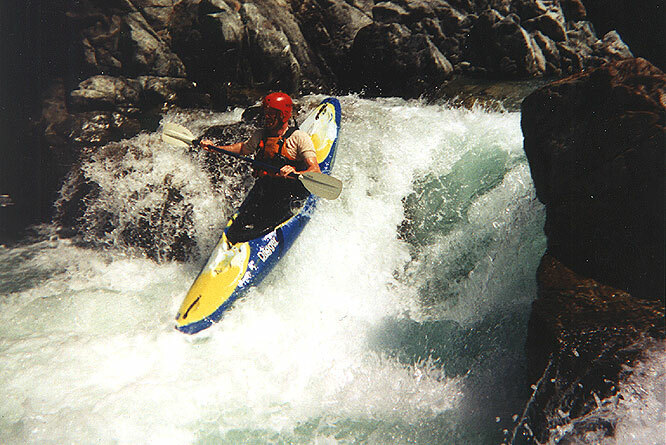 The resulting class V-VI rapid was extremely dangerous and ended up claiming the life of a veteran kayaker. 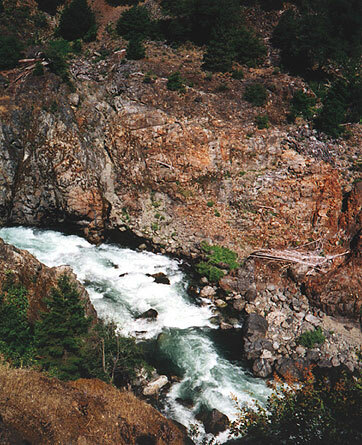 Because the Salmon was becoming well known with boaters, the state decided to blast a hole in the rapid in the early 80s and thus created the modern day falls. The 8-foot drop should be run with momentum, boofing right to avoid a relatively meaty hole. 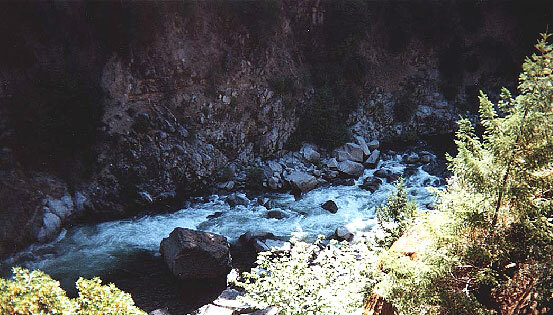 Over the next 2-3 miles are innumerable class III and IV rapids. Many of these are quite steep and you often cannot see the bottom of the rapid until you are right on the edge. In these cases, scouting is definitely warranted and is more often than not accomplished on river left. Although we did not encounter logs or any other obstructions, there are many rapids where logs could be a problem, so be wary. About halfway through the gorge on a hard left turn is Cascade Falls (class IV+). Not really a true falls, this rapid drops about 25 feet over 100 yards. Scouting left along the rocky outcropping revealed at least four possible routes. The easiest route at higher flows is a relatively straight shot down the far left; however, below 1000 cfs rocks begin poking out of the water and require some quick maneuvering. Far river right is probably the most exciting, as you plunge over a 12-15 foot falls. The narrow exit and large curler waves deterred us from this choice. We ended up running one of two center 8-foot ledges. After dropping into the pool below, we paddled over to the left side and ran the remainder of the rapid there. Tom at the base of Cascade Falls. The river resumes its class III/IV character for the remainder of the run until about half a mile above Butler Creek. Here a boater encounters in quick succession Last Chance (class IV) and Freight Train (class V). To be honest, the first happened so fast (and was essentially indistinguishable from all the other rapids upstream) that I really donít remember our exact lines. I think we ran Last Chance down the far left to avoid the hole at the bottom. At higher flows, this hole is reported to be extremely sticky. We fortunately had no problems. Freight Train, on the other hand, is unmistakable. As you exit Last Chance and round the corner left you are faced with a steep, complex boulder garden that appears to dead end into the right canyon wall. Get out and scout either river left or right. Running this down the center, where most of the flow went, was not an option the day we were there. Midway through the rapid the water poured over a wide ledge. The resultant hole was backed up by a large rock and thus appeared to be pretty much terminal. Tom opted for 'exploring' river left. After running the class III in, he paused briefly in an eddy before dropping over main ledge. Immediately below this, he smacked a few hidden rocks, but otherwise his run was pretty clean. The entry to Freight Train. My run down river right, however, proved to be a bit more exciting. After snapping the last photo in the camera, I surveyed what lay below. After a small eddy on the right, I would drop over a small ledge into the main current and towards a big rock. I would have to go right of the rock in order to avoid being swept left into the terminal hole. Below the rock on the right it appeared I would have a relatively easy run-out; a few big waves and some holes, but it looked easy enough. All went according to plan except that the main current was far stronger than I anticipated. BAM! I was sideways up against the rock. "Oh crap, oh crap!" Amazingly I was quite stable, situated squarely between the currents swirling down either side. Not wanting to drop backwards into the hole, I reached forward around the end of the rock with my paddle and pulled myself around. Free at last, I started to breathe again. At the bottom I let out a mighty whoop, quite high on adrenaline. As we rounded the next corner, the bridge over Butler Creek came into view. "You're kidding, that's it?!?" I asked Tom. "That wasn't so bad." and it wasn't. I'm sure at 1500+ cfs the whole demeanor of the river changes, but at 700 cfs the overall run was far less fearsome than I feared.